There are many ways to keep your cat healthy and happy throughout their life. Below is a breakdown of life stages cats advance through, and how to best support them in each stage. Kittens (0 – 6 Months) – Kittens have a very high play drive. Now is the best time for gradual positive introductions to children and other pets. It is also the right time for your cat to become comfortable with nail trims, tooth and coat brushing, carrier training, and transportation. Junior (6 months – 2 years) – Inter-cat aggression may develop at this stage of life along with sexual maturity. Be sure to use appropriate play with your cat. Prime (3 – 6 years) – Many people assume their cat is young and healthy and don’t go to the veterinarian for regular check-ups. However, your cat will benefit from regular check-ups to keep them healthy and prevent any disease or illnesses. Mature (7 – 10 years) – Play activity begins to decrease and your cat becomes more likely to gain weight. Senior (11 – 14 years) – The human equivalent at this stage is about 70 human years. 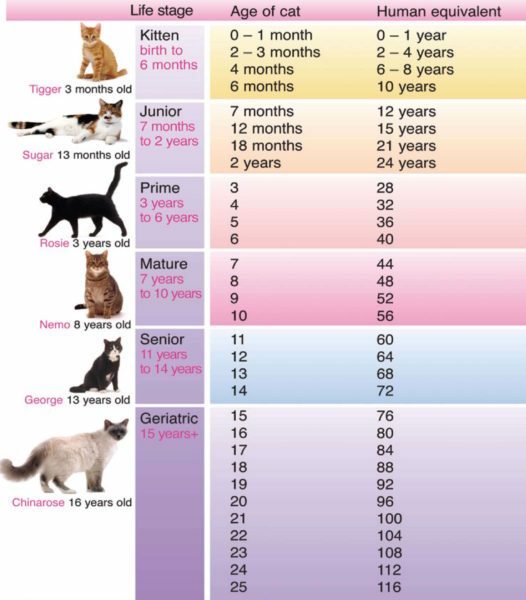 Geriatric (15 years and over) – Senior and geriatric cats that exhibit behavioral changes (e.g., vocalization, changes in litter box usage) should be evaluated more frequently for an underlying medical problem.